Sometimes I feel like I’m nothing but a Fabric Herder. I simply move fabric, from one area to another. I try to keep it within boundaries. If it threatens to over run the edges of its container, I shove it back in. Occasionally I have to “Thin The Herd”! But I’m also a Good Fabric Herder, I’ll go searching for the “One That Was Lost” and find use for the smallest obscure scrap to the point where I know I am bordering on ridiculous. But if that one small scrap will do the job it needs to do --- if it will fill its purpose---then it has value, and therefore just as good as any NEW fabric that I could bring into the Herd. There has been a LOT of herding going on during the entire month of December down in the basement. It all started with the 2-1/2” strip bins. Remember the BEFORE? I’ve done it all ---ALL the sizes now have color families and containment enforcement! 1-1/2” strips! CHECK!! You will notice that there are two big bags of neutrals? Those were all pulled out of the amazing string package I was gifted by Alycia D in Marrietta, GA! There were lots of strips pre-cut to this width…BONUS! In with the 1-1/2” strips they went! Next it was the 2” colors. They are in there! Can you believe that I now have ONE EMPTY DRAWER? This took up two drawers before I organized it. And those rolls of strips are EASY to simply unroll on the table top, pull the strips I want out of it, and roll them back up and back in their bags they go. This is going to save on ALL those ravelly edges! 2” Neutrals. I use these A LOT! I do tend to use my 2” strips more than the 2-1/2” ones –it’s just the scale that I prefer in my patchwork. There are not as many neutral 2” strips as there are other things because I get into these constantly. With that revelation clear to me…it explains why there are twice as many 2-1/2” strips than anything else! These take up 2 drawers. Remember my discovery of JUST HOW MUCH PINK there was?? The wild pinks are now contained and ready for a project. There are just more GUYS in my family than girls, and I don’t do a lot of pink quilts --- as an accent, yes, but quilts don’t often turn out predominantly pink in my world. I may have to change that just to use some of these up! 2-1/2” neutrals and there isn’t a whole lot of them either! So when I’m making something, I’ll go to these bins first, pull what I can use, and then add to them with strips cut from Fat Quarters or yardage to make the mix more insteresting, and this gives me new fabrics to work with. But these are right here ready at my finger tips. The 3-1/2” drawer doesn’t have much in it either! I don’t tend to do big enough blocks that use this size a lot, but I have SOME. I have a question for you regarding saving strips. I know you said that you tend to save 1.5, 2, 2.5 and 3.5 inch strips. However, the more I peruse the patterns, I see more 2-inch used than anything. So I guess I'm asking what do you do with the other sizes? I know if I set myself down I could probably convert some of them to using the 2.5 inch strips... but I'm just wondering if saving all of the sizes, especially the 3.5, is really 'worth it'.. if you know what I mean. I guess I need some advice on this one. Thanks for taking the time to answer. It really IS just that easy. Look at what you are sewing. What sizes of blocks do you usually find yourself drawn to? Look at the past several projects. Look at ones you’ve set aside as “wannado’s” for the future. What sizes are they going to use? CUT THOSE. Don’t worry about the others. You can always cut the other sizes later. As for me – I have learned where I need to fill in, and what NOT to cut! Ahem…do NOT let me cut ANYMORE 2-1/2” PINKS!! These are my boxes of crumbs. And I admit this is not all of them. THIS is what makes me feel like a hoarder instead of a herder ---and I am on the lookout to find another “extreme piecing” project that will put these to good use. Probably something paper-piece-able so it would be an easy take a long project with little prep ahead of time needed. Whatever happens…do NOT let me break down and sort these by color family and iron each piece, okay? Cuz if I do --- you will surely know that I have jumped into the deep end!! If I get brave enough --- I may show you my strings and where they live too. But just maybe! You have been one busy lady, getting all those pressed, sorted, and stored neatly. Way to go on using your downtime productively! Enjoy your last day at home! Rut-roh, Reorge! I have my crumbs sorted by color. Certainly not by size, but definitely by color. Most are in 2 or 3 gallon ziplocks ... then contained in larger containers. Good luck! :) Stay out of the deep end! I though I had a lot of scraps to sort. Don't you pre-cut the scraps into 4", 3", 2.5" and 2" anymore? I have bins with those in too. It takes more time but it is fun to throw them up on the wall and make some fast 9-patches or a scrappy dolly quilt out of them. I have way too much time on my hands right now...but MY TOTES are staying closed until Next year. I'm glad you are organized. I don't like those fuzzy edges either. I am always inspired by your scrap savers system, it just seems to get better and better. Since i started organizing my scraps I have been able to use up old fabric and not waste it or throw it away. I even gather scraps from my Mother when I visit her. She throws it away and I have fun using it and remembering what was made from it. I haven't quite sorted by color yet, but can see it would help. Thanks for sharing your method. You've done a great herding job on your strip bins! I know it took time but you have such a "get-er-done" approach that it seems to have taken no time at all. Now, just between you and me (and I swanee I won't tell a soul) don't you have a twin, or did you go and clone yourself a few times?? The zip lock system is so essential, best in the business, and the plastic storage bins, so easy to work with. I am still working on those 'crumb' things and agree, do not expect me to do much with them beyond saving them!! Have a great new year and safe travels. Okay Bonnie a job well done herding all those scraps! I have several id4eas to toss out to you on the crumbs there is always a scrappy Pickle Dish you could paper piece. Or you could just "make" fabric out of them by just sewing them together. Then cut strips with your Accucut to use in string blocks or cut squares using the squares as centers of a star block. Ardis in TX who is also a herder! So now I know there is a name for what I did last night. I "herded" a lot of fabric back into bins after not putting it away for far too long. Not nearly as organized as yours, but at least I can move around much better in the sewing room. My suggestion to Nancy would be, save the 3.5" strips for triangles. If needed, she could always cut them into smaller strips later. When you mentioned those pinks and no use for them immediately I thought Breast Cancer Quilt! That would be a good use for them! Wow, Bonnie, and I thought I had a large amount of scraps! Hee hee! I have been going through my studio also, trying to get organized for the coming year. There are lots of scraps that don't seem to lend themselves to pre-cutting....what do you do with those? Try to fit them into a pre-cut size or leave them? Mine isa work in progress...sort of...on the progress part. Bonnie, I love it! I too, feel like a fabric herder at times. I just move fabric from bin to bin. And just when I feel like I'm making progress, I too, have those bins of misc. that I just don't want to tackle (and maybe shouldn't). Keep up the good work.. Thanks for the new name. I prefer "herder" to "hoarder" any day. Bonnie, you are a great at organizing. But I can't see where we need all those strips of sizes that you do.You are going so many different things whereas we are just trying to stay afloat with one or two or three quilts. At least, I am. Thanks for all the good things you do. you could paperpiece that with your tiny crumbs. I tend to use my scaps to make donation quilts, so I generally cut 2 1/2", 3 1/2", and 4 1/2" strips/sqs from scraps. 1 1/2" and 2" pieces make the donation projects more labor-intensive than I'm willing to do. Bonnie - great! Have been admiring of your strip cutting system for years, but never done it myself - all those ravelly edges were what put me off. A lot of the Moda materials do it badly, and our local Da Gama (South Africa) does it too, and that's just while you are working with it, sewing it into quilts! not only later when you are dipping into bins for it! So I'm really pleased you've decided on this method of storing - it makes such good sense - and I don't feel such a wimp in having been doing it that way myself - it seemed so pernickety, in the face of what I considered your lovely free and easy style of doing things. All strength to your cutting and sewing arm. Margaret. So cute. I definitely need to work on my herding skills. Sadly, I think I've mastered the hoarding part. Bonnie, you've just performed a public service. I'm sure I speak for a lot of us when I say, gee, I only have one bin of scraps. Time to get to work and acquire more. Hee, we may turn the entire economy around. I have some of those containers and LOVE them! I have all my scraps together in ONE of those containers. I thought it was too much as it is! hehe. I could probably make 3 quilts with the scraps within that one bin, but the organizing it part would put me over the edge, LOL. Per your advice to cut what I personally use...my choice would be 1 1/2". I have TONS of 2 1/2" strips that I barely use. I like smaller pieces. I do have a few 3 1/2" strips mostly in neutrals. But they are easily cut down to whatever size I need. I also keep containers of squares in your sizes. I also have two boxes of those 4" squares from Keepsake quilting. Each has over 2000 squares in them. I am using them for my "tumbler" quilt which will be ginormous when done. To compliment them I have cut a whole container of 4" neutral squares. I've been saving crumbs, but I decided on Tuesday, as I was cutting pieces for Christmas Lights, that anything that won't make a 1 1/2" square is going to be given to DH to use as gun cleaning patches. So I'll be going through that drawer, cutting squares and GIFTING. I know what you mean by feeling like a hoarder because of those little pieces...so I'll let DH do the hoarding. It won't get them out of the house, but it gets them out of my sewing room. They may say that you are crazy and obsessive and they may be right -lol- but you are also very wonderful! Thanks for sharing and giving me such great ideas. Love your blog! So funny and timely to see your comment on herding/hoarding today. I got back from our local Home Depot with 6 plastic bins so I can start sorting my fabric stash into something that is more manageable than the bags and shoe boxes etc that I am currently using. Being organized is my holy grail! Hey Bonnie,I don't think I will ever be that organised but I admire those that are! Thanks for visiting my blog, Bonnie, and yes we missed you last week too! But you have obviously been very productive! Happy New Year! Here's a great extreme scrap project for 2012. Email Jantine (link on that blog) and she will send you the foundation pattern. I've made a test block and have been busy cutting house pieces out of my crumbs and squares bins and sorting them into a sectioned box. I'm especially having fun finding bits of novelty fabrics for the doors and windows. Hi Bonnie, I have a question about "crumbs". What exactly is a crumb? Is it anything smaller than 1 1/2 inches, or is it an odd-shaped piece of any size? Or something else? Hi Bonnie! Happy New Year! Are you familiar with Linda Hibbert? She does extraordinary paper piecing patterns and uses itsy bitsy teeny tiny pieces. Just a thought for your crumbs. If you sign up for her newsletter, you get the patterns free. Check it out! I think I have lots of fabric that is until I visit you blog! But sometimes I just don't have the right colour. I have been using your scrap saver system for a couple of years now and have found I haven't touched my 3.5" strips, other to cut to smaller strips. So maybe from now on when I'm cutting I will cut the smaller strips...makes sense. Your day looks a lot like mine. Seems like scraps keep breeding in the dark, but somehow quilts come out at the end from time to time. I do keep my crumbs sorted by color, but they are in decorative jars so it seems more like a collection than a hoarding issue. That's what I keep telling myself anyway. for your crumbs: make a diamond template. I made mine 9" tip-to-tip, but any size would do of course. I like fabric piecing (muslin) rather than paper because having to rip off the paper creates instant ufo's for me, heh-heh... - same as for my string quilts. Crumb Piece the diamonds in contrasting colors. I saw this idea in a magazine (I am not that brilliant!) - can't remember which one, though. Am working on it between other projects. makes a beautiful quilt. Oh Bonnie, you go girl with organizing! IA... Ironers Anonymous... calls me alllll the tiiiiime. Maybe my "crumbs" will make it into several half filled old pillow cases (sewn shut) to bring to the animal shelters. It isn't as if I won't have any more ever! New Year’s Eve Edition–Free Kindle Book! Cookin’ it up in Texas! Sandy’s Boxing Day Sew In! With Give-Aways! Mystery Monday Link-Up! Part 6! Christmas Afternoon Edition! Free Kindle Book! Evening Edition ---Free Kindle Book! Oatmeal, Pecan & Craisin Cookies! The Ms Bee-Haven’s Christmas Party! Mystery Monday Link Up! Part 5! Bed-Time Edition! Free Kindle Book! What NOT to buy at the Antique Mall! Just a Little Workshop Shout Out! More from the Antique Mall! Evening Edition --- Free Kindle Book! Evening Edition! Free Kindle & Nook Book! 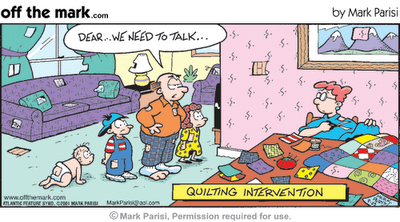 Story Time Stars --- Quilting! A Night with Trans Siberian Orchestra! Afternoon Additon --- Free Kindle book! Holiday Freebie --- Paper Pieced Tree! Quilt-Jacking ---Get the Word Out!